Post NFPA sign on flammable chemical containers, such as those of acetone and ethanol, to relay general hazard information for emergency personnel. 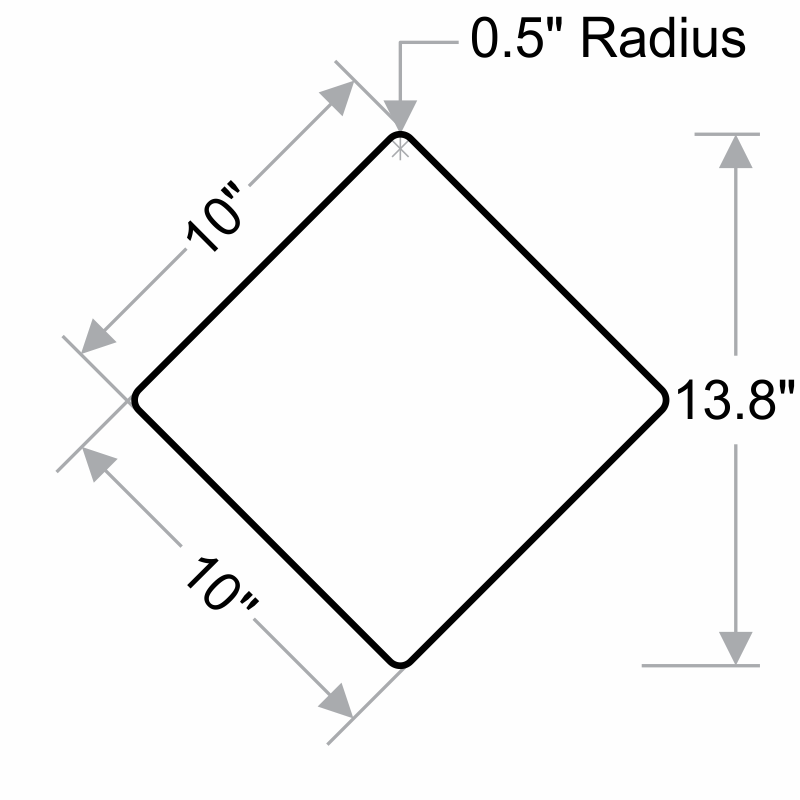 This NFPA sign measures 14" tip-to-tip (but when you measure the sign as a square, they are 10" long on each dimension). Each number is about 3" high – which using common visibility benchmarks, should be legible from 100-150' away. This gives firefighters plenty of time (and space) to safely gauge their proper response to an emergency, spill or fire. 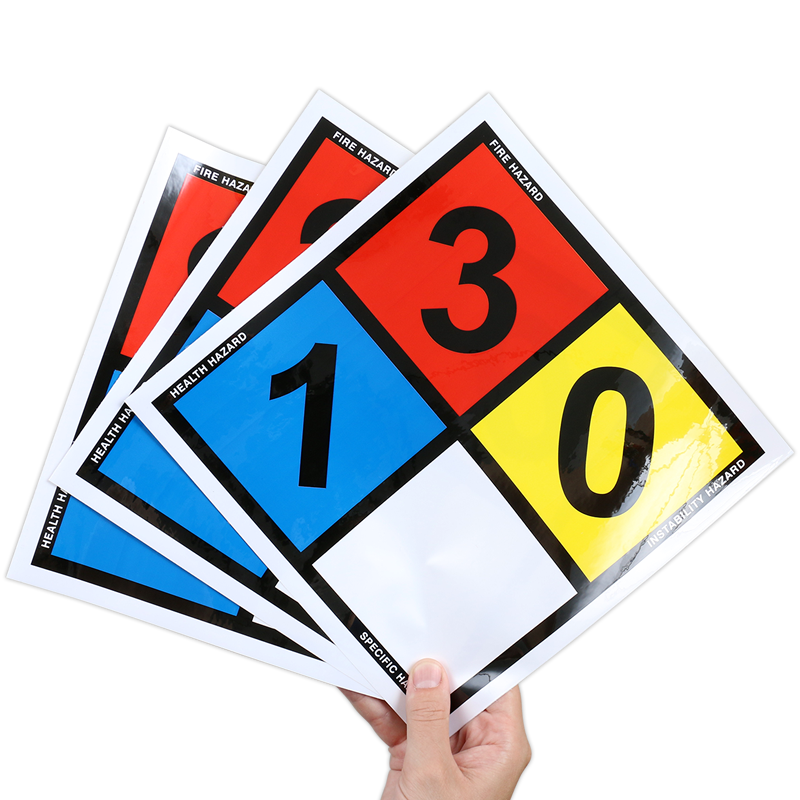 • This sign is often used for Acetone, Gasoline 56-100 Octane, 1-Hexene, 1-Octene, 2,2-Dimethylbutane, 2-Methyl-1-Pentene, 3-Hexanone, Allyl Acetate, Amyl Acetate, Amyl Alcohol, Amyl Chloride, Butyl Acetate, Butyl Alcohol, Cyclohexane, Cyclohexene, Cyclohexenone, Cyclopentane, Diethyl Ketone, Ethyl Acetate, Ethylcyclohexane, Heptane, Hexane, Isoamyl Acetate, Isobutyl Acetate, Isobutyl Alcohol, Isohexane, Isopropyl Acetate, Isopropyl Alcohol, Jet Fuels (JP-4), Methyl Acetate, Methanol, Methyl Alcohol, Methyl Ethyl Ketone, Methyl Propionate, Naptha, Petroleum (Crude), Propyl Acetate, Propyl Alcohol, Turpentine, and Valeraldehyde.